The possibility of an earthquake is a reality for many California residents. That's why it's important to make sure your home is properly reinforced to resist seismic forces. Homes built before 1985 are especially vulnerable to earthquake damage, but buildings of all ages and styles can benefit from reinforcement with approved structural connectors and other structural reinforcement. Saber Foundation Repair are the local experts for seismic retrofitting and earthquake retrofitting services, and we can help you get right preventative measures for your home's foundation. If you're concerned about your home's foundation and are interested in seismic strengthening, call us today at 1-877-203-4601 or click below to get your evaluation and estimate in Los Angeles, Long Beach, San Diego and the nearby areas. The before photo shows the sill plate that needs bracing for strength. The during photo shows how we install the row of bolts in to the sill plate. The after photo shows the way we bolt the bracket on to the footing, securing the sill plate to the footing. Before and after of raised foundation without and with cripple wall sheathing. The before pictures shows an existing post, located in a crawlspace. The after photo shows the work preformed by Saber, the post is now secured with T-straps. Before photo is an area in a crawl space that will be secured by sill plate bolting. The after photo shows the work preformed by Saber, using the sill plates to bolt the area, and secure it. Please note these photos are taken in a dark crawl space under the property, so the lighting is not the best. The before photo shows the footing and sill plate that needs a UFP bracket installed for seismic retrofitting. The after photo shows the UFP installed. 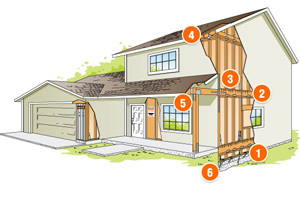 To help ensure a structurally sound home in an earthquake, first floor framing must be secured to the foundation (1), second floor framing must be tied to the first floor (2), beams and joists are tied together (3), roof framing is connected to the wall top plate (4), posts are secured to beams (5), and minor foundation cracks are repaired with epoxy. The seismic retrofitting process involves the installation of engineered metal connectors and other reinforcement materials at key stress points throughout your home's structure. The specially designed hardware includes hold downs, anchors & anchor bolts, strap ties and framing angles. Wood blocking and structural sheathing may also be incorporated into many earthquake retrofitting packages. The goal of the retrofitting process is to counteract three main earthquake-induced forces that can cause major damage to a building: racking, sliding and overturning. In engineer-speak, the retrofitting process transforms a building with loosely connected parts into a unified structure with a "continuous load path" that extends from the building foundation up through the walls and all the way to the roof framing. Our experienced crew will utilize an impressive arsenal of seismic connectors to keep your house structure together in spite of seismic forces that can easily tear an un-reinforced house apart. Saber Foundation Repair's seismic retrofitting services are only available for homes with raised foundations. We do not work on mobile homes or seismically retrofit any other type of property without a raised foundation We do not certify the seismic retrofit work of other companies, nor do we conduct inspections solely to certify that a home is seismically retrofitted for insurance or other purposes. Your home and your family will have a better chance of surviving an earthquake. Proper installation of seismic hardware will help minimize earthquake damage, reducing home repair costs following a seismic event. Professional retrofitting has the potential to reduce home insurance premiums. A comprehensive home seismic retrofit "package" can typically be installed in just 1-2 days. Don't wait until it's too late! Contact Saber Foundation Repair today for a seismic inspection and seismic retrofitting estimate. 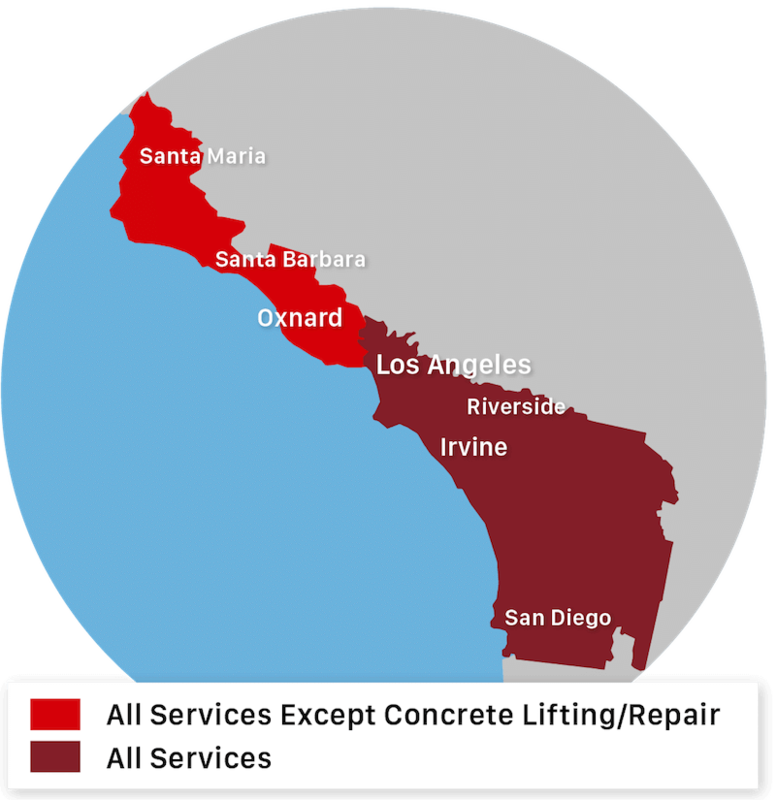 We provide our professional seismic retrofitting and concrete foundation repair services to residents throughout California, including Los Angeles, Long Beach, San Diego, Santa Ana, Anaheim, Irvine, Glendale, Chula Vista, Huntington Beach, Oxnard, and the nearby areas!